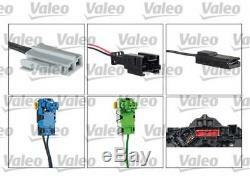 VALEO 251641 - Steering Column Switch. 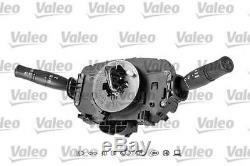 Parts: VALEO 251641 - Steering Column Switch Colour: Black Supplementary Article/Supplementary Info: with airbag clock spring Combi Switch Function: with light dimmer function. RENAULT MEGANE II (BM0/1_, CM0/1_) Hatchback [11/2002-01/2011] 1.9 dCi (BM0G, CM0G) [11/2002-02/2008] - 1870 cc - 88 kw - 120 ps - F9Q 800 RENAULT MEGANE II Coupé-Cabriolet (EM0/1_) Convertible [09/2003-12/2009] 1.6 [09/2003-03/2009] - 1598 cc - 83 kw - 113 ps - K4M 760, K4M 761 RENAULT MEGANE II Coupé-Cabriolet (EM0/1_) Convertible [09/2003-12/2009] 2.0 [09/2003-12/2009] - 1998 cc - 99 kw - 135 ps - F4R 770, F4R 771 RENAULT MEGANE II Coupé-Cabriolet (EM0/1_) Convertible [09/2003-12/2009] 1.9 dCi [09/2003-03/2009] - 1870 cc - 88 kw - 120 ps - F9Q 800 RENAULT MEGANE II Saloon (LM0/1_) Saloon [09/2003-] 1.4 [09/2003-] - 1390 cc - 60 kw - 82 ps - K4J 732 RENAULT MEGANE II Saloon (LM0/1_) Saloon [09/2003-] 1.4 [09/2003-] - 1390 cc - 72 kw - 98 ps - K4J 730, K4J 740 RENAULT MEGANE II Saloon (LM0/1_) Saloon [09/2003-] 1.6 [09/2003-] - 1598 cc - 83 kw - 113 ps - K4M 760, K4M 761 RENAULT MEGANE II Saloon (LM0/1_) Saloon [09/2003-] 2.0 [09/2003-] - 1998 cc - 99 kw - 135 ps - F4R 770, F4R 771 RENAULT MEGANE II Saloon (LM0/1_) Saloon [09/2003-] 1.5 dCi [09/2003-] - 1461 cc - 60 kw - 82 ps - K9K 722 RENAULT MEGANE II Saloon (LM0/1_) Saloon [09/2003-] 1.9 dCi (LM0G, LM1G, LM2C) [09/2003-] - 1870 cc - 88 kw - 120 ps - F9Q 800 RENAULT MEGANE II (BM0/1_, CM0/1_) Hatchback [11/2002-01/2011] 1.9 dCi [03/2004-08/2006] - 1870 cc - 68 kw - 92 ps - F9Q 808 RENAULT MEGANE II Saloon (LM0/1_) Saloon [09/2003-] 1.9 dCi [03/2004-] - 1870 cc - 68 kw - 92 ps - F9Q 808 RENAULT MEGANE II Saloon (LM0/1_) Saloon [09/2003-] 1.5 dCi [02/2004-] - 1461 cc - 74 kw - 101 ps - K9K 728, K9K 729 RENAULT MEGANE II Coupé-Cabriolet (EM0/1_) Convertible [09/2003-12/2009] 2.0 16V Turbo [05/2004-03/2009] - 1998 cc - 120 kw - 163 ps - F4R 776 RENAULT MEGANE II Coupé-Cabriolet (EM0/1_) Convertible [09/2003-12/2009] 1.9 dCi [05/2005-02/2007] - 1870 cc - 96 kw - 131 ps - F9Q 803, F9Q 804 RENAULT MEGANE II Saloon (LM0/1_) Saloon [09/2003-] 1.5 dCi [05/2005-] - 1461 cc - 63 kw - 86 ps - K9K 724 RENAULT MEGANE II Saloon (LM0/1_) Saloon [09/2003-] 1.5 dCi [05/2005-] - 1461 cc - 78 kw - 106 ps - K9K 732 RENAULT MEGANE II Saloon (LM0/1_) Saloon [09/2003-] 1.9 dCi [05/2005-] - 1870 cc - 96 kw - 131 ps - F9Q 803, F9Q 804 RENAULT MEGANE II Saloon (LM0/1_) Saloon [09/2003-] 1.9 dCi (LM14, LM1D) [05/2005-] - 1870 cc - 81 kw - 110 ps - F9Q 803, F9Q 804, F9Q 816, F9Q 818 RENAULT MEGANE II Coupé-Cabriolet (EM0/1_) Convertible [09/2003-12/2009] 1.9 dCi [05/2005-03/2009] - 1870 cc - 81 kw - 110 ps - F9Q 804, F9Q 816, F9Q 818 RENAULT MEGANE II Coupé-Cabriolet (EM0/1_) Convertible [09/2003-12/2009] 2.0 dCi [09/2005-03/2009] - 1995 cc - 110 kw - 150 ps - M9R 700, M9R 722 RENAULT MEGANE II Coupé-Cabriolet (EM0/1_) Convertible [09/2003-12/2009] 1.5 dCi (EM1E) [03/2006-06/2008] - 1461 cc - 78 kw - 106 ps - K9K 732 RENAULT MEGANE II Saloon (LM0/1_) Saloon [09/2003-] 2.0 dCi [09/2005-] - 1995 cc - 110 kw - 150 ps - M9R 700, M9R 722 RENAULT MEGANE II Saloon (LM0/1_) Saloon [09/2003-] 1.6 16V [01/2006-] - 1598 cc - 82 kw - 112 ps - K4M 812, K4M 813 RENAULT MEGANE II Coupé-Cabriolet (EM0/1_) Convertible [09/2003-12/2009] 1.6 16V [01/2006-06/2008] - 1598 cc - 82 kw - 112 ps - K4M 760, K4M 761, K4M 812, K4M 813 RENAULT MEGANE II Coupé-Cabriolet (EM0/1_) Convertible [09/2003-12/2009] 1.5 dCi (EM16) [01/2007-06/2009] - 1461 cc - 76 kw - 103 ps - K9K 734 RENAULT MEGANE II Saloon (LM0/1_) Saloon [09/2003-] 1.6 [05/2005-] - 1598 cc - 77 kw - 105 ps - K4M 762 RENAULT MEGANE II (BM0/1_, CM0/1_) Hatchback [11/2002-01/2011] 1.9 dCi [11/2002-02/2008] - 1870 cc - 85 kw - 115 ps - F9Q 804, F9Q 816, F9Q 818 RENAULT MEGANE II Coupé-Cabriolet (EM0/1_) Convertible [09/2003-12/2009] 1.9 dCi [09/2003-03/2009] - 1870 cc - 85 kw - 115 ps - F9Q 804, F9Q 816, F9Q 818. The item "NEW VALEO 251641 Steering Column Switch with light dimmer function" is in sale since Tuesday, August 14, 2018. This item is in the category "eBay Motors\Parts & Accessories\Car & Truck Parts\Interior\Switches & Controls". The seller is "autodetuk" and is located in Tallinn. This item can be shipped worldwide.